Guide Price £350,000 to £370,000This extended four bedroom detached family home occupies a corner plot, giving it excellent outside space, which includes both front and rear landscaped gardens and a substantial driveway. There are two generous reception rooms as well as a well equipped kitchen breakfast room. The four well proportioned bedrooms are all capable of accommodating a double bed. Excellent access to Braintree town centre and railway station. GUIDE PRICE £350,000 TO £370,000 Being situated on a corner plot gives this property both a decent front garden as well as a fair sized driveway. There is space a plenty in this home starting with a spacious entrance hall ideal for busy family's in a rush to get out or for welcoming friends. Two similar sized reception rooms are enhanced by the extended kitchen diner, all giving the property a versatility that suits the modern family. A down stairs WC completes the ground floor. 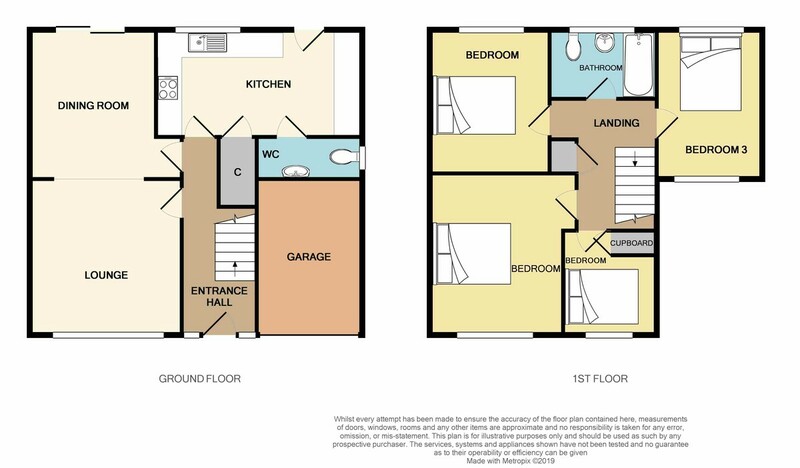 To the first floor there are four well proportioned bedrooms with even the smallest with its built in storage being able to accommodate a double bed. A large family bathroom provides the amenities to all the bedrooms. Externally to the front a block paved driveway runs up to the garage which has an up and over door and power and light. A mature hedge runs along the remainder of the front boundary, further bushes and an established Silver Birch tree sit on a lawned area. A gate to the side leads through to the rear garden, here there are two paved patio areas, the rest of the garden is mainly laid to lawn with various ornamental trees and shrubs spread evenly throughout. There is a Mediterranean style side garden with summer house, the focal point of this area being a glorious established magnolia tree. ENTRANCE HALL Original oak flooring, radiator, stairs to first floor. Double glazed windows flanking multi locking door to front. LOUNGE 12' 11" x 12' 6" (3.94m x 3.81m) Ornamental fireplace with inset electric fire, radiator, double glazed window to front. French doors opening to dining room. Smooth ceiling TV point. DINING ROOM 12' 01" x 10' 6" (3.68m x 3.2m) Double glazed patio doors to garden, smooth ceiling, radiator. French doors to lounge and door to hallway. KITCHEN BREAKFAST ROOM 16' 3" x 9' 3" (4.95m x 2.82m) Smooth ceiling, tiled flooring, double glazed window looking out over rear garden, Double glazed multi locking door to rear. Range of eye and base level units, roll edge work tops, with inset sink. Space for washing machine, dishwasher, fridge freezer and cooker. Space for kitchen table and chairs. Storage cupboard. WC Double glazed window to side, low level WC, wash hand basin. Smooth ceiling, tiled flooring, chrome ladder style towel rail. LANDING Banister rail over stair well, airing cupboard, access to loft, doors to four bedrooms and bathroom. Stairs to ground floor. BEDROOM 1 13' 1" x 11' 3" (3.99m x 3.43m) Double glazed window to front, radiator. BEDROOM 2 12' 3" x 9' 10" (3.73m x 3m) Double glazed window to rear, radiator. BEDROOM 3 12' 8" x 7' (3.86m x 2.13m) Double glazed windows to both front and rear, radiator. BEDROOM 4 8' 11" x 7' 6" (2.72m x 2.29m) Built in storage cupboard, radiator, double glazed window to front.